Parker Kligerman tweets a picture of Kyle Larson's car in the rear view mirror while the pair wait their turn to test at Daytona International Speedway. After a long day of testing at Daytona International Speedway, the drivers and crews approached the evening session with an eye towards capping off a successful test session. While most teams made single-car runs, that left a lot of time for the drivers and teams to take to social media. Check out some of the best NASCAR selfies, in-car views and the always-impressive Daytona International Speedway under the lights. 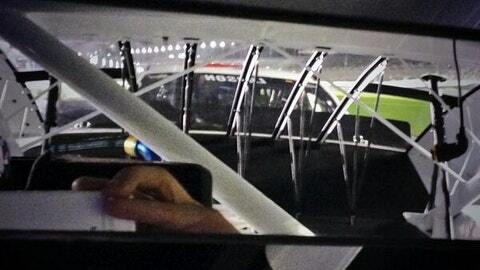 Not one of the most active drivers on social media, Ryan Newman got in the spirit showing the world his view of testing, and posting this great nighttime selfie. After Rusty Wallace was finished his stint in the Team Penske No. 2 car, it was back to business for 2012 Sprint Cup Series champion Brad Keselowski. With the lights on around the track, many drivers used their phones to show fans the interior of their cars, with the lights of their instrument panel glowing bright. What are drivers to do while sitting on pit road waiting to hit the track for their turn at a testing run? Tweet pictures of each others’ cars of course. The Sprint Cup teams packed up their tools after a rain-shortened test session, but will be back at the ‘World Center of Racing’ in only a few weeks to kick off Speedweeks. Great test today @DISupdates Think we can have a race winning car when we come back for the 500. 🙏 Now Off to Philly for fan event! Can't brag enough on everyone @RCRracing! Hard work in the off-season has paid off with really good speed! @austindillon3 P1 & we were P2. Apparently Jimmie Johnson wasn’t just working on finding speed in the car, he was also working on his latest hashtag now that #6pack is a just another accomplished goal.